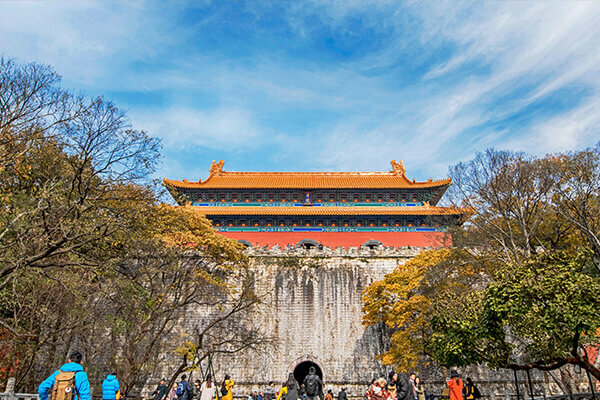 Located in Dulongfu at the southern foot of the Zhongshan Mountains, is the tomb of the founding emperor of the Ming Dynasty, Zhu Yuanzhang, and his Empress Ma. The construction of the mausoleum started in the Hongwu reign period of the Ming Dynasty .With a circumference of 22.5km, the tomb was over 30 years in construction . The existing architectural structures in the mausoleum include the Tablet Pavilion, Sacred Way, Hall of Tablets, Xiaoling Hall, Square City Tower, Precious Dome and Soul Tower, presenting a gorgeous and magnificent view. As one of the largest imperial mausoleums in China, the Xiaoling Mausoleum has been included in the World Cultural Heritage List.